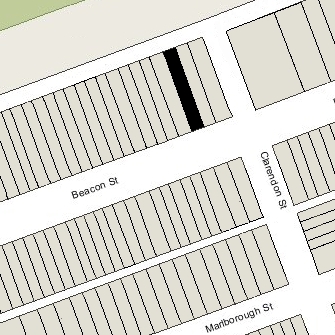 186 Beacon is located on the north side of Beacon, between Clarendon and Dartmouth, with 184 Beacon to the east and 188 Beacon to the west. 186 Beacon was built ca. 1869 William Appleton. He and his wife, Emily (Warren) Appleton, lived at 76 Beacon. He was the son of shipping merchant and Congressman William Appleton. Born Joseph Warren Appleton, he changed his name in 1848 to William (his elder brother, William Sullivan Appleton, had died in 1836). William Appleton purchased the 24 foot wide lot for 186 Beacon on March 6, 1869, from William Craig Wharton. He and his wife, Nancy Willing (Spring) Wharton, lived at 127 Beacon. The lot was part of a 30 foot lot he had purchased on March 11, 1861, from the Boston and Roxbury Mill Corporation. He had sold the western 6 feet in December of 1862. Click here for an index to the deeds for 186 Beacon. William Appleton had 186 Beacon built as the home of his son-in-law and daughter, James Arthur Beebe and Emily (Appleton) Beebe, who were married in April of 1869. Prior to their marriage, J. Arthur Beebe had lived at 30 Beacon with his parents, James Madison Beebe and Esther Elizabeth (Brown) Beebe. He was a wool merchant in his father’s firm. 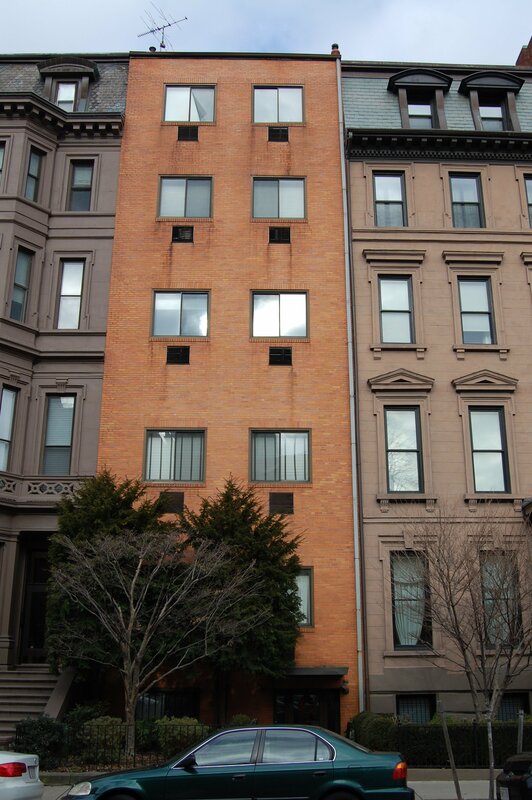 J. Arthur and Emily Beebe lived at 186 Beacon during the 1880-1881 winter season, but moved thereafter to 83 Beacon. In 1890-1891, they built a new home at 199 Commonwealth. In 1882, 186 Beacon was temporarily the home of Elizabeth (Torrey) Spooner, the widow of shipping merchant Daniel Nicolson Spooner, and their two unmarried daughters, Ellen and Mary. They previously had lived at 23 Commonwealth, and by the 1882-1883 winter season had moved to a new home she had built at 196 Commonwealth. The house was not listed in the 1882-1885 Blue Books. On October 6, 1884, 186 Beacon was purchased from the estate of William Appleton (who had died in February of 1877) by George Peabody Gardner. He and his wife, Esther (Burnett) Gardner, made it their home. They had married in June of 1884 and 186 Beacon probably was their first home together. Prior to their marriage, he had lived with his father, George Augustus Gardner, at 51 Commonwealth. George P. Gardner was a trustee and president of various textile companies. During the 1895-1896 winter season, the Gardners were living elsewhere and 186 Beacon was the home of Jane Huntington (Watkinson) Norton, the widow of Rev. Frank Louis Norton. She had lived at 209 Beacon in 1893. She had moved from 186 Beacon by the 1896-1897 season and the Gardners had resumed living there. By the next season, Jane Norton was living at 30 Gloucester. In June of 1906, George Gardner applied for (and subsequently received) permission to build an automobile garage at the rear of the building. The garage was designed by architect Willard T. Sears. George and Esther Gardner continued to live at 186 Beacon until his death in June of 1939. They also maintained a home at Monument Beach, Massachusetts. After his death, Esther Gardner moved to an apartment at 6 Arlington. 186 Beacon was shown as vacant in the 1940 and 1941 City Directories. On November 27, 1940, 186 Beacon was acquired from George Gardner’s estate by real estate dealers Warren-Stevens, Inc.
On December 17, 1940, 186 Beacon was purchased from Warren-Stevens, Inc., by Gordon Keith Simpson. He previously had lived at 115 Marlborough with his mother, Sarah (Boocock) Simpson, the widow of James Simpson. By 1942, he was operating 186 Beacon as a lodging house. In July of 1944, he applied for (and susequently received) permission to subdivide the property, creating a separate single-family residence at the rear, in the garage building facing Back Street, and keeping the main building as a single-family residence. In December of 1944, he applied for permission to convert 186 Beacon from a single-family dwelling into fourteen units. He appears to have abandoned the application. Gordon Simpson continued to live at 186 Beacon until about 1948. In 1949, 186 Beacon became the fraternity house of the Boston University chapter of Theta Kappa Phi (referred to as the Associates of St. Thomas fraternity in the City Directories), with recreational rooms on the first two floors and dormitories on the upper floors. In 1951, Gordon Simpson was cited for numerous fire and egress violations, and also for failing to obtain approval to use the building as a dormitory. In August of 1951, he applied for permission to remodel the property and convert into a fraternity house. He appears to have abandoned that application, however, and in November of 1951, he applied for (and subsequently received) permission to convert the house into eight units. 186 Beacon was shown as vacant in the 1952-1959 City Directories. On November 12, 1957, the Brookline Federal Savings and Loan Association foreclosed on its mortgage to Gordon Simpson. On March 11, 1958, it was acquired from the bank by Joseph B. Conley of Salem. On February 2, 1960, 186 Beacon was acquired from Joseph Conley by the S. S. Ganick Corporation. 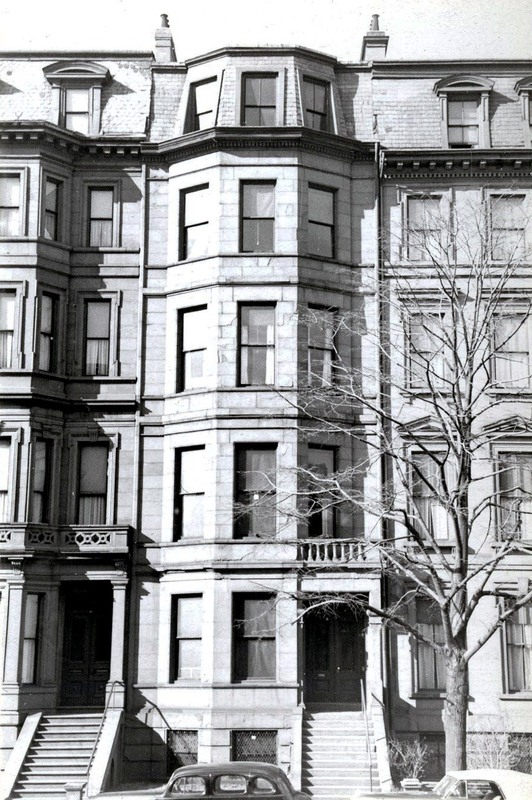 In April of 1960, it applied for (and subsequently received) permission to significantly remodel the building, including lowering the front entrance to the basement level, removing the bays and brownstone facade, and replacing the mansard roof on the fifth floor with a with a two-story (duplex) apartment, creating a six story plus basement building . As proposed, the front windows were to have been a single rectangle of aluminum casement windows on each floor and there was to have been an iron balcony across the windows on the new top story. 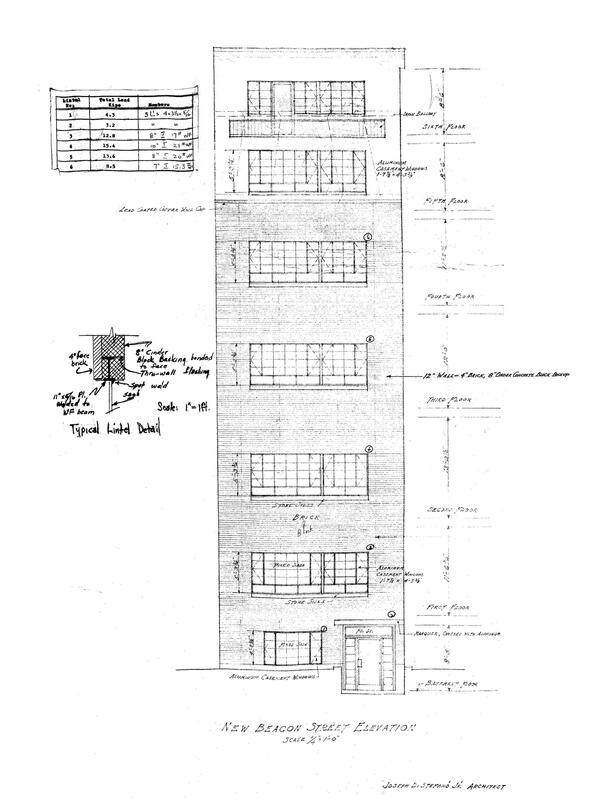 Plans for the remodeling, designed by architect Joseph DiStefano, Jr. , are included in the City of Boston BLueprints Collection in the Boston Public Library’s Arts Department (reference BIN R-230). As built, the duplex apartment, additional story, and balcony were eliminated, and two separate windows replaced the proposed single rectangle of windows on each floor. The building remained eight units (the remodeling application indicated that the building currently was a single-family dwelling, which appears to be incorrect based on the various uses during Gordon Simpson’s ownership). On May 25, 1973, S. S. Ganick Corporation converted 186 Beacon into six condominium units, the 186 Beacon Street Condominium. 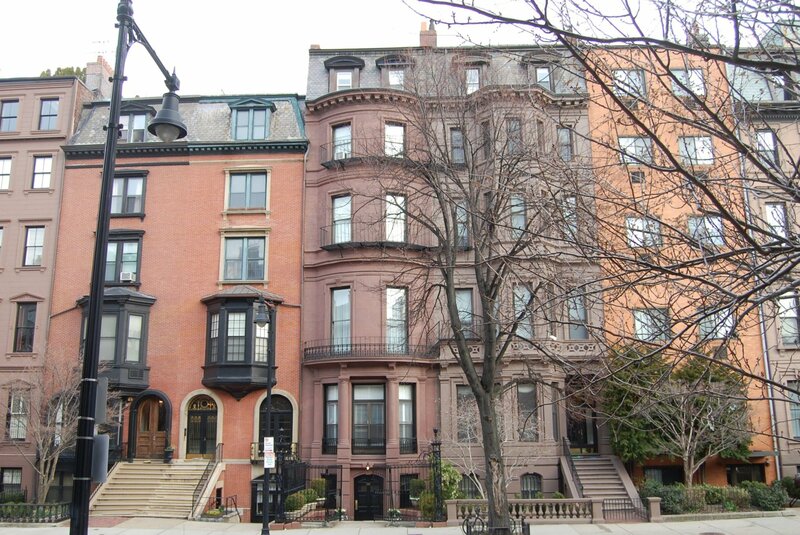 In October of 2000, the 186 Beacon Street Condominium Trust applied for (and subsequently received) permission to replace the garage at the rear with a open parking court.